Who is Blessed Ghebre Michael? He was a pilgrim, a seeker, an Ethiopian, a scholar, and a martyr for the faith. He differs in three major ways from the other canonized and beatified members of our congregation. First, he was not European, but African. Second, we was not born Catholic, but an adult convert. And third, he was not a confrere. 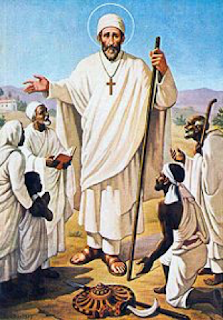 Born in Ethiopia in 1790, Ghebre Michael was a pilgrim in life, always seeking truth. He became a monophysite monk at the age of 19 and was a gifted student. He remained restless in his search for the truth. He made a long pilgrimage from Ethiopia to Cairo to Rome to Jerusalem. It was on this pilgrimage that he met Justin de Jacobis for the first time. It was also on this pilgrimage in Rome that he found himself very attracted to the Catholic Church. Ghebre Michael shared his desire to be received in the Catholic Church with Justin de Jacobis. He joined the Church in 1844. Six years later, Justin asked him to consider becoming a priest and Ghebre Michael agreed. He was ordained in January 1851. 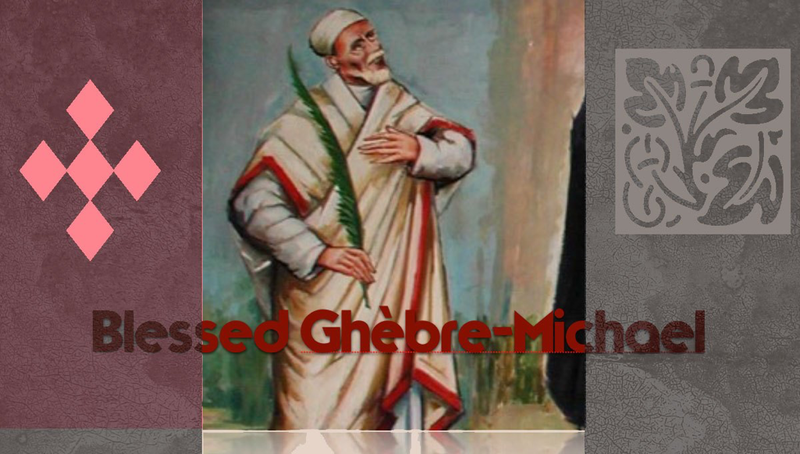 Ghebre Michael helped enormously in the foundation of the clergy. He composed a dictionary of the Ge'ez language used in the liturgy. He wrote a source book about the Catholic faith which was simple and clear. He produced a textbook in dogmatic theology. But Ghebre Michael was destined to suffer greatly. Just before being ordained, he had been imprisoned for two months at 60 years of age. Later, when persecution broke out, he was imprisoned again. This time, so was Justin de Jacobis. Justin was treated better than Ghebre Michael because his former colleagues among the Orthodox seemed to have a special hatred toward Ghebre Michael. He was tortured repeatedly and urged to renounce Catholicism. He was led from place to place in chains and, bloodied by beatings, presented before crowds. He was knocked to the ground often and, when he rose to his feet again and again, the people proclaimed him a second St. George, the saint who was said to have had seven lives. The king, because of political pressure from the British and perhaps also because of the esteem Ghebre Michael had among the people, decided not to execute him. Rather, he decreed that Ghebre Michael must carry his chains to the end of his life. He trudged in procession from town to town behind marching soldiers, resisting appeals to renounce his faith. Finally, exhausted by the ordeal that lasted 13 months, he died on the roadside and was buried nearby at the end of August 1855. Many have tried to locate his grave, each without success. "I beg you to accept the picture which I have the honor to send you. It catches the likeness of the subject so exactly that, when you consider the lack of skill in the matter of drawing on the part of the Abyssinian priest who did it, you must admit that it is really an extraordinary picture. To this picture of the Abyssinian martyr, Ghebre Michael, I have added an inscription in Latin in which I refer to him as a Vincentian seminarist. In fact, he was only a postulant because the time of his vocation could be counted only from the moment when he would have begun his intern seminary; by the date which had been arranged he was already in prison; however, in his heart, he already belonged to the Congregation." Ghebre Michael was beatified as a martyr in 1926. Written by Sister Patty Evanick, D.C.